When applying directly to overseas universities, the process can be complicated and confusing, not to mention the time-zone difference. University admissions teams are assessing thousands of applications every week. Attempting to get answers to your questions about entry requirements, program details and your application status could take a while. We make life easier for you: Headquartered in Singapore, we are officially appointed by overseas universities to assist you with the entire application & visa process. As our operation is fully funded by universities, all services are free of charge for students in Singapore. Why use our application service? 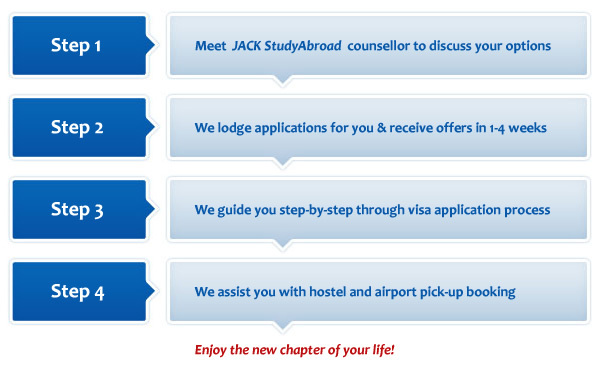 JACK Studyabroad has been appointed as official representative in Singapore by hundreds of overseas universities. We could certify your documents so that you do not need to post them to the University to avoid delays and we could process your application faster, more accurately and possibly achieve better outcomes. If you are unclear about any aspect of the entry requirements, or you need further advice on universities, you can always talk to us. We help you make your own decisions about studying abroad. As we directly liaise with universities regarding your application, we know who to talk to if there are any issues on your application, and we know how to present your case perfectly. It is much easier to have someone experienced guide you through the whole process! Don’t forget all these services are free for students as we are fully funded by universities. You will be assigned an experienced locally based consultant to assist you with the entire application & visa process.